We are going to venture to say we have the largest selection of beautiful, quality silk wild rags and western scarves to pick from anywhere!! Be sure and check out our Scarf Slides and Pioneer Shirts as well! Buy two or more wild rags/scarfs (all but the 20” scarfs) and deduct $2.00 per scarf!! and how they look over a vest. 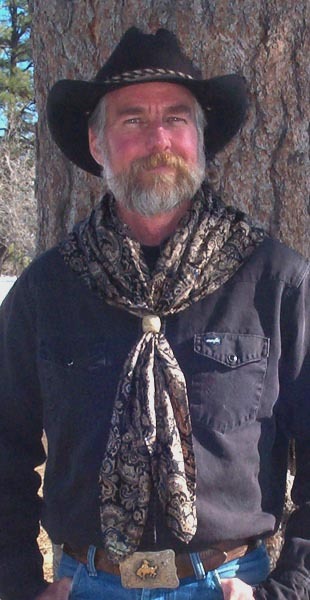 Bob is wearing the Cattle Kate Black Paisley scarf (no longer available) with a rawhide braided scarf slide. 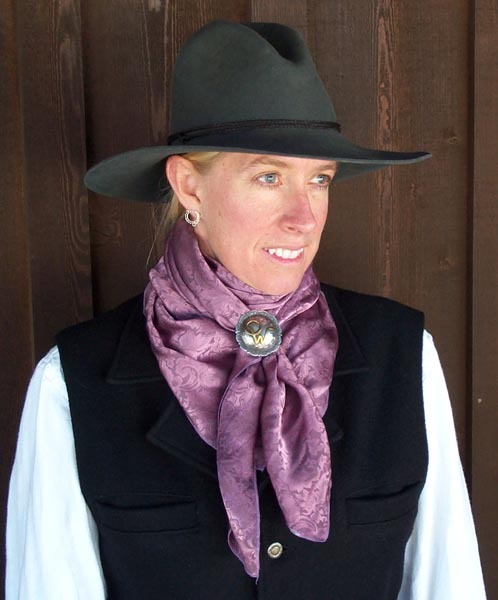 Terri is wearing the Cattle Kate Mauve AS-SJ scarf with a matching Scrunchie. The scarf slide is custom sterling silver with the OWS brand in brass. 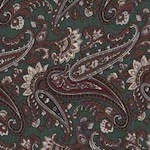 There is a tall tale behind this knot.....whether true or not it is a good story! 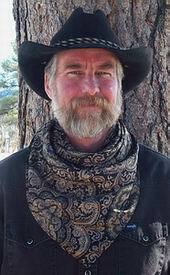 We are told that back in the day there was a crooked Texas Ranger who was said to be in cahoots with the train robbers. 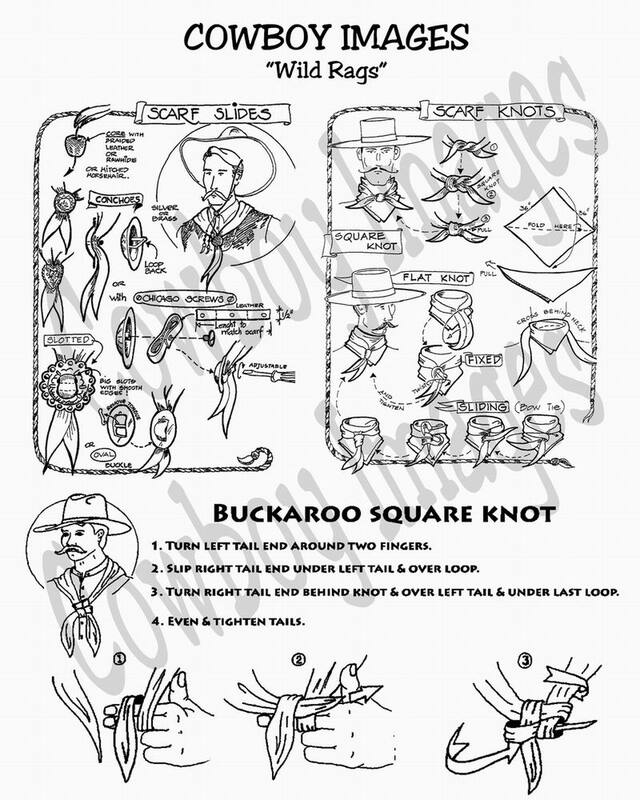 The Ranger would wear the buckaroo knot showing the 4 point square when there was gold on the train. If there wasn't gold, he would flip over the knot showing the backside which looks very different....don't bother to rob the train! 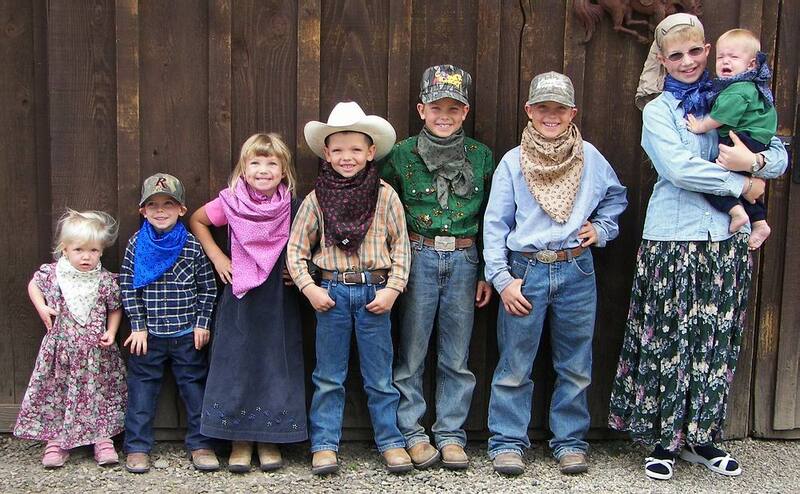 The Logan Bunch modeling their new Wild Rags in 2007! 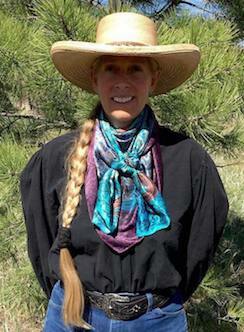 WHY WEAR A SILK SCARF/WILD RAG? 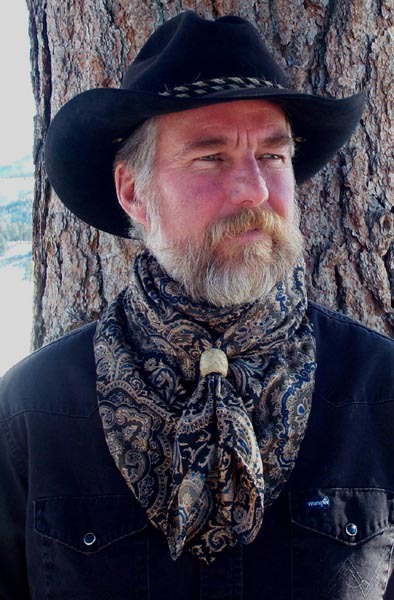 The scarf performs many functions for the cowboy. It is often pulled over the nose and mouth to cut down the choking effects of trail dust. 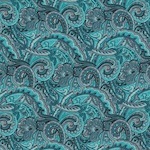 It is employed as a cover for a spooked horses eyes. 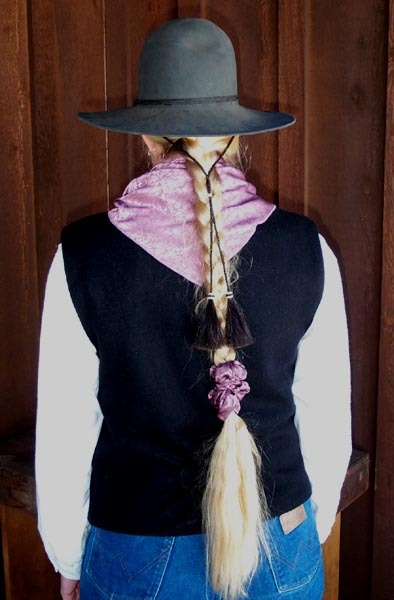 Also used as a hobble, as a hat tie down in windy weather, as a washcloth and towel, as a bandage, tourniquet, napkin, water filter, pot holder, flag, and temporary repair for saddle or bridle. For nearly 5000 years silk has been sought after because it is naturally warm, breathable, insulates and is lightweight. 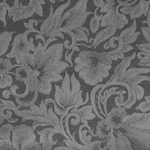 Silk is an ideal fiber worn next to the body. Silk (unlike polyesters) wicks away moisture while keeping the body warm and dry, making it one of the most absorbent of the natural fibers. It is warmer than wool. Gets softer with wear. To clean, wash in cold water either by hand or in a washing machine on delicate cycle. Do not use bleach when washing, only use mild laundry detergent or hand soap. Hang dry and then press with a warm steam iron set at or below the silk setting. 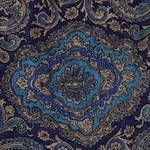 The more you wear your silk scarf, the softer it will get. Colors will lighten over time. Although silk is pretty tough it does need gentle care to make them last.